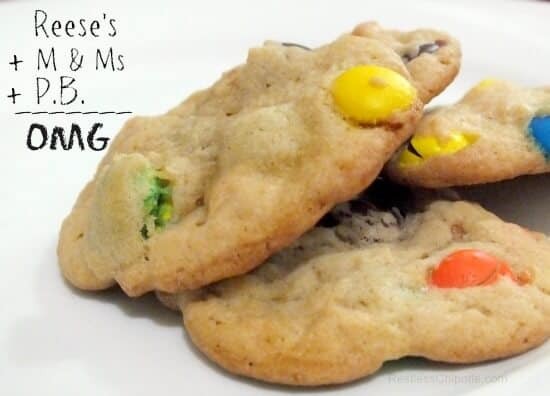 Restless Chipotle » Chewy M & M Cookie Recipe: Lunch Box Favorite! 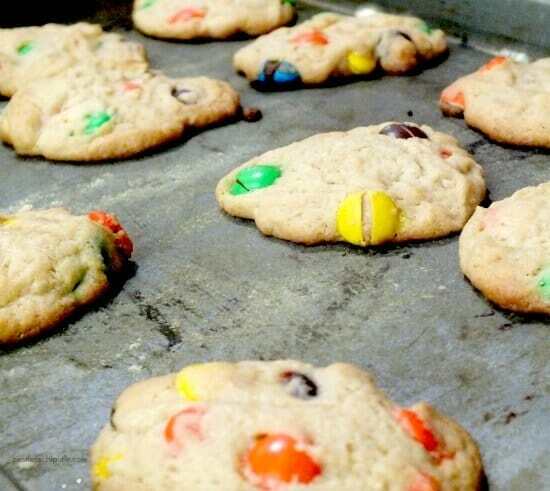 What’s better than chewy M & M cookies? Almost nothing unless it is a chewy peanut butter M & M cookie with Reeses Pieces added for good measure. 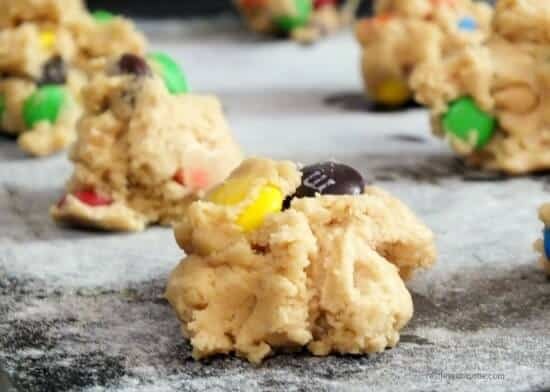 If you are an M & Ms addict these cookies are for you… unless you are allergic to peanut butter. If you are then please give the Cream Cheese M & Ms cookies a try. I will freely admit that I have a weird quirk – actually several of them. I prefer the red M & Ms over any other. I had my children convinced at one point in time that the red ones must always be given to me. My husband, who has a slight addiction to the candy that melts in your mouth not in your hands, is sweet enough to pick out the red ones and save them for me. He also generally has a stash of Reese’s Pieces in the night stand which the kids raid on a regular basis. Sadly, Reese’s does not have red ones which lowers the quality of their product quite a lot as far as I am concerned. I do like them as long as I can overlook the fact that they are not red. One night I mixed my beautiful, crimson M & Ms with some of the “other color” Reese’s and the combination was yummy, of course. I decided to make M & Ms cookies and add some Reese’s for good measure. As I was getting ingredients out of the pantry I spotted a jar of peanut butter. Yeah. They are moist and chewy with delicately crispy edges. That’s my favorite texture for a cookie – and one you can’t get from commercial cookies. The trick is to bake them enough that they are not raw in the middle but they are not quite done either. They will cook a little as they cool. It may take some practice but pretty soon you will be able to figure out when to take them out by the way they look. For drop cookies I usually dust the sheet with flour after I grease it. 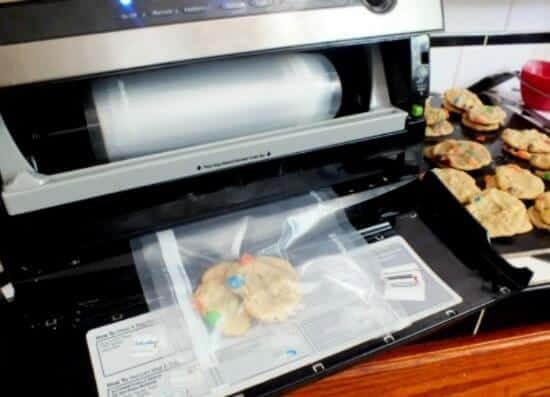 This keeps the cookies from sticking and it helps keep them from spreading. You just need to make sure you don’t use too much flour and you shake the excess of the sheet. They may or may not travel well. I sent vacuum sealed packages of these to both of my sons that are in the Air Force, one in Korea and one in Japan. The ones that went to Korea arrived intact and fresh and delicious. The ones that went to Japan arrived in tiny pieces but I was assured they were delicious none-the-less. Give the cookies a try. I think that you will like them. They are an unusual treat for lunchboxes and after-school snacks. Oh, and I added peanuts to mine just to intensify the peanutty flavor and give them some more texture. You could use crunchy peanut butter or leave them out – these cookies will still be good. 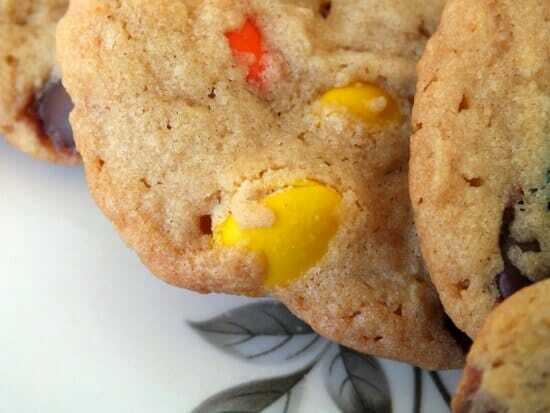 Chewy M & M Cookie Recipe – and Don’t Forget the Reeses Pieces! Let butter and eggs come to room temperature. Do not use homemade or all natural peanut butters - they just don't blend right.